OATA - What is an Athletic Therapist? Athletic Therapy is a health care profession that specializes in the prevention, assessment and care of musculoskeletal disorders (muscles, bones, joints) especially as they relate to athletics and the pursuit of physical activity. WHAT DOES AN ATHLETIC THERAPIST DO? The Athletic Therapist, in cooperation with other members of the health care team, is an integral part of a total service to maximize individuals’ performance and welfare. The Athletic Therapist also nurtures an attitude of positive health. A Certified Athletic Therapist utilizes contemporary rehabilitative techniques, therapeutic modalities, physical reconditioning and supportive strapping procedures to promote optimal healing and prepares the individual for safe reintegration into an active lifestyle. 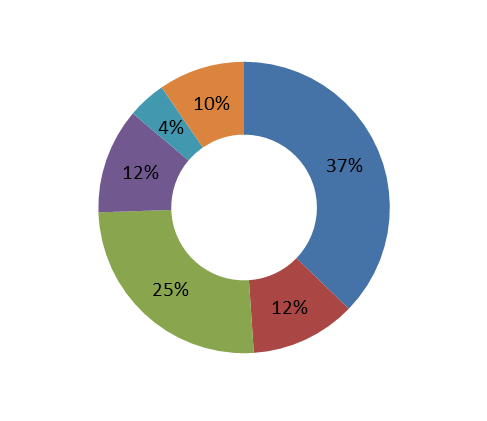 WHERE DO ATHLETIC THERAPISTS PRACTISE? The Ontario Athletic Therapist Association (OATA) is the professional association that governs the practice of all Certified Athletic Therapists in the province of Ontario. After having completed an internship comprised of both clinical and field work, a stringent written and practical set of national examinations must also be successfully completed. 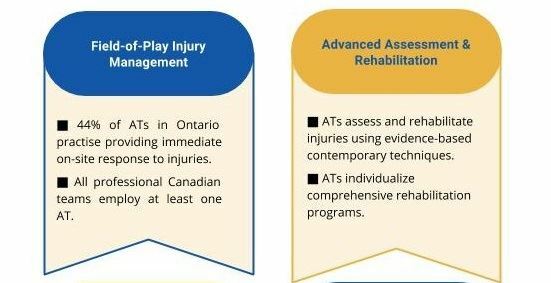 Canadian Athletic Therapists must participate in a mandatory maintenance of certification program. This ensures that all Athletic Therapists annually demonstrate that they have remained current with the developments in their professional field. Athletic Therapy is one of the very few Canadian health care professions that requires its members to upgrade on an annual basis. The OATA endeavours to ensure that all of its members are offering safe and effective treatment to all of their clients and patients. Continuing education programs, examination preparation courses, publications and participation as a member of the Sports Medicine Council of Ontario are examples of the many initiatives undertaken by the OATA. The OATA is a recognized chapter of the Canadian Athletic Therapists Association. All professional members of the OATA have passed university or college courses specified by the CATA. The Athletic Therapy profession can be divided into four main ‘components’ that define the role of an Athletic Therapist in addressing the needs of an active population.